Quiet, efficient and spacious, our range of integrated dishwashers work away behind a kitchen cupboard door discreetly out of sight. They have an A+ energy efficiency rating and use far less water than washing by hand. 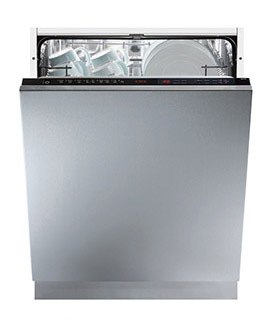 No matter the size of your kitchen, with our slimline 45cm range-everyone can have a dishwasher at home. Specialist features like a top level cutlery basket on the WC600 or an LED interior light make using these models easy and never a chore. You will barely even notice that they are on whilst they work to clean your cookware, cutlery and crockery to hygienic perfection. We have created a range that includes every level of dishwasher, so that you can match your new appliance to your needs, household and budget. There is the WC142 that offers a full size washing capacity of up to 13 place settings and some all-important features like LED rinse aid and salt indicators to alert you to when these levels need topping up. It has 5 wash programmes that cover all the main load types from a prewash or quick wash right through to a hot ‘intensive’ setting that will loosen the grip of even the most burnt-on lasagne left on your dishes. All our models feature an electronic softener adjustment that gives you control over the water hardness level in your area. With harder water, detergents have to work harder to foam and clean grease and dirty. Adjusting this setting levels the playing field to give everyone excellent wash results, wherever in the country they are. Delay timers are ideal for finishing up the jobs in the kitchen, without needing to start the wash programme straight away. If you have an open plan home you might not want the evening to be disturbed by an appliance running or you may want to make the most economical use of low energy tariffs at night. Using the delay timer lets you start the cycle at the most convenient time for you so that you can return to clean and dry plates when you are ready to put them away or use them. Each model has height adjustable baskets that let you lift them up to create more head room on the bottom level. This is perfect for when you need to wash pans with long handles, baking trays or larger cookware items. Our intelligent dishwashers like the WC371, WC480 and WC600 have sensors to adjust water and detergent levels based on the level of soiling on the plates, pots and pans. So now even an appliance can wash as well as by hand by giving it some extra elbow grease, just when you need it. All our dishwashers come with anti-flooding safety measures so that, if something should go wrong, the water supply is cut off and your kitchen is safe from excess damage. 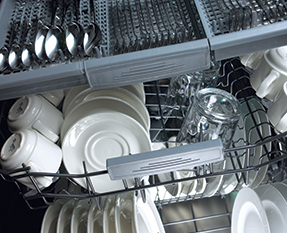 With energy levels of A++ a CDA dishwasher is an affordable, efficient and practical aid in your kitchen that, once installed, you won’t want to live without.